After you are satisfied with how the colors have carefully blended and you have repeated the steps on your other eye, it is time to tie everything together. Curl your eyelashes if you wish. 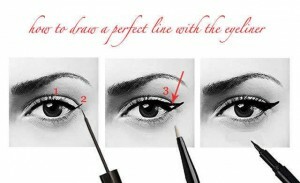 Afterwards, apply gel eye liner. Again, keep the eye liner as close to your upper lash line as you can, going all the way to the outside corner and slightly beyond, tapering to an upward pointed tip. Apply mascara on your upper and lower lashes and you are done with your bronze eyes. Just perfect for a summer party.